From a young age Niki McDonald – also known as Tapestry Girl – has been a creative person. As she grew so did her awareness of the world and art as an extension of herself. 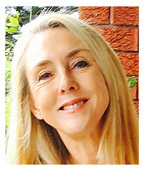 Niki completed a Bachelor of Creative Arts with a Major in Textiles at Wollongong University, NSW. It was three years of weaving, dyeing, spinning, stitching, printing, creating and falling in love with textiles as an art form. 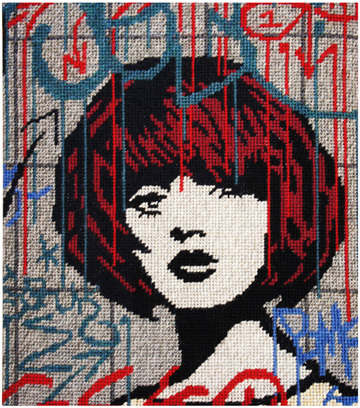 As life moved on, needlepoint tapestry became Niki’s main medium. Needing a clean, portable art form that required no studio and could accompany her to all kids’ activities led to hours sewing while her children had swimming classes, kicked balls, attended birthday parties or played in the park. As Niki’s art practice continues to evolve, experimentation ignites curiosity and results in a practice that is engaging and industrious, looking to the urban landscape for inspiration. 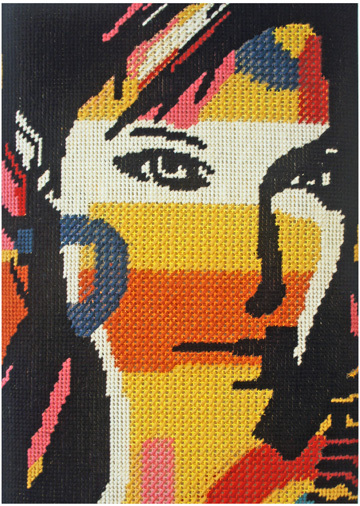 The repetitive nature of needlepoint allows her to connect with her intuition and inspires her to think outside the box using basic tools and techniques. Keeping her work limited to six colours, using the repetition of halfcross stitch to emulate the pixelation in dot matrix, or creating a more chaotic experience by changing the cross stitch size while key black lines are used to bring the image together. Niki’s work has gained recognition in Australia, New Zealand, the USA, the UK, Africa and Europe including publications in Holland and France. 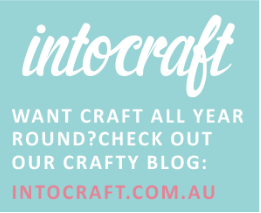 Niki is part of a textile group, The Seed Stitch Collective; whom facilitated the Seed Stitch Contemporary Textile Award in 2018 for NSW textile artists. 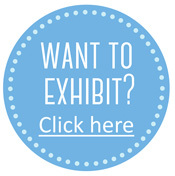 The finalists work was exhibited at the Australian Design Centre. 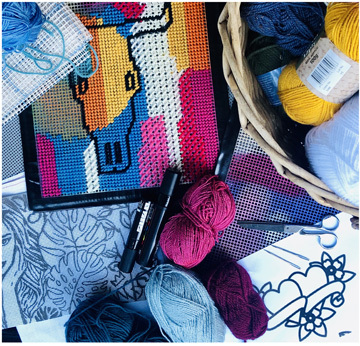 Free class at 2pm daily Needlepoint tapestry is the perfect combination of art meets craft and you’ll find the rhythmic flow of sewing is soothing and uplifting. Learn the half cross stitch traditionally used in needlepoint tapestry and easily achieve a textile art piece. Explore the elements of design and how to use a stencil to create your own tapestry canvas. This class will provide you with the skills and inspiration to continue at home.